As much as I love strawberries, I am absolutely thrilled that it's cherry season--and I'm certainly not alone! Whether it's their glorious ruby hue, the crisp snap that you experience at first bite, or the juicy combination of sweet and tart, there's something about cherries that makes it worth the minor nuisance of dealing with the pits and the risk of cherry juice stains on white fabric. 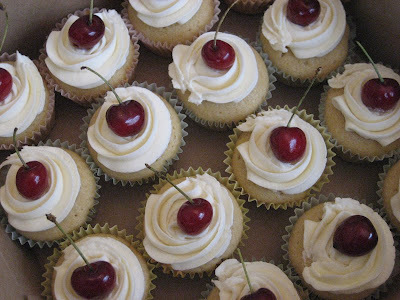 When Quetzal ordered two batches of cupcakes for a dual birthday celebration with her friend, I practically leaped at the opportunity to use fresh cherries as garnish. 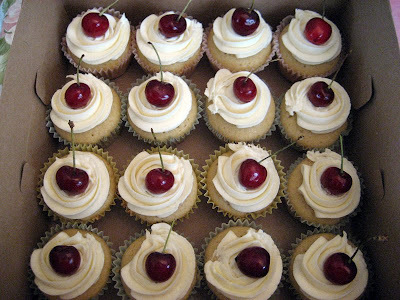 Fortunately, one of the requests was for a batch of bourbony Manhattan cupcakes, and what Manhattan is complete without a cherry? Move over, maraschinos, these beauts are fresh off the tree, so much tastier, and free of your scary neon red hue. Here we have buttery bourbon vanilla cupcakes with bourbon buttercream frosting--both infused with Maker's Mark--topped with a fresh whole cherry, stems and all. Let's take a closer look, shall we? Because bourbon was the liquor of choice among both the birthday guy and gal, I replaced the vodka in my usual Mudslide recipe with bourbon. 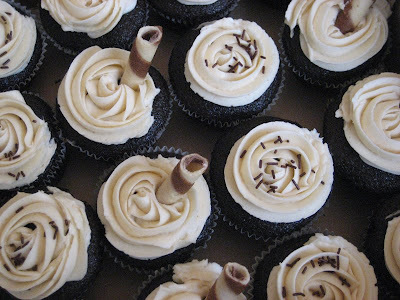 These were dark chocolate coffee cupcakes with Maker's Mark and Kahlua in the batter, swirled with Bailey's buttercream frosting, and topped with chocolate pirouette cookie "straws" or chocolate sprinkles. 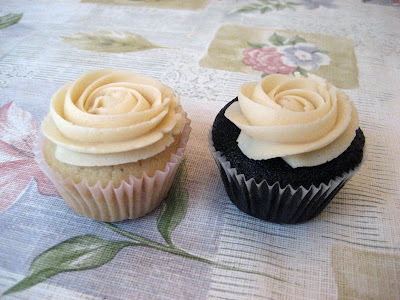 And as for leftovers, here are a pair of unadorned Manhattan and Mudslide cupcakes, sitting side by side. Talk about a match made in cupcake paradise! Thanks, Quetzal! I hope you and your friend had a very sweet birthday celebration!